Tune in to the student-produced news programs about Hauppauge schools. During the month of March, the band will be helping raise money for LI Cares by participating in a Practice-A-Thon! The band will be helping others, while students are helping themselves get better by practicing! For every minute a child practices at home students can raise money for our local food bank. Please click the title to view more information. 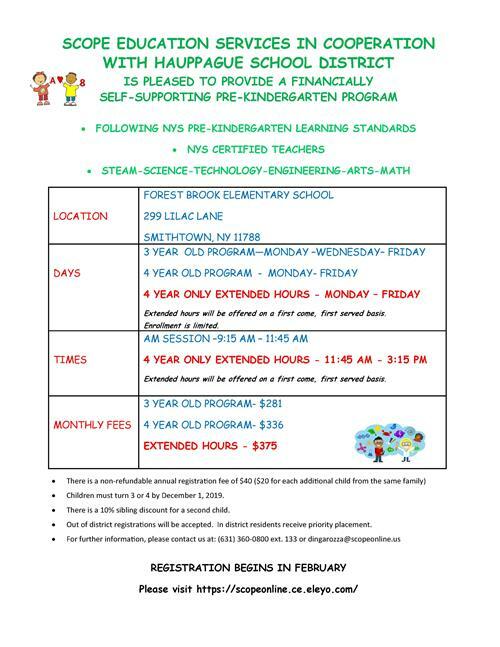 SCOPE Education Services in cooperation with Hauppauge School District is pleased to provide a financially self-supporting pre-kindergarten program at Forest Brook. Click the title to view the flyer for additional information. It has been said the third Monday of January is "Blue Monday". It may be a result of coming down from the excitement of the holidays, it may be the shortness of the days or the cold. Whether statistically accurate or not it is known that some people face winter blues. Forest Brook students and staff will be on the "Hunt for Happiness" all week. The event was inspired by the Secret Society of Happy People. There will be daily activities and an award for students who participate. Happy hunting! 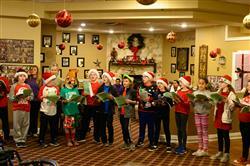 Forest Brook's 4th & 5th grade chorus students visited the Arbors in Hauppauge to sing some holiday songs and spread some cheer!